Medically known as Acne Vulgaris, this skin condition involves oil gland at the base of hair follicles. Medically speaking acne is not dangerous. However, it can leave undesirable marks and scars on your face. There are often psychological effects associated with acne, such as poor self mage, depression and anxiety. It is essential to seek professional help at the earliest to avoid and minimize unwanted scarring. Our Doctor will first investigate the cause of your acne. After understanding the cause, the severity of your condition will be evaluated following which we will create a tailor made treatment plan for you. Treatment usually involve a combination of oral medication, professional peels and sublative laser scarring. Acne, commonly known as pimples, spot or zits is a disorder of the sebaceous glands(oil glands). Overactive sebaceous gland produce too much oil that leads to blocked pores. This in turns promotes bacterial growth show in the form of bump on the skin. The primary trigger of most cases of acne is hormonal imbalance. Hormones stimulates the oil glands that produce more sebum, which can block pores. 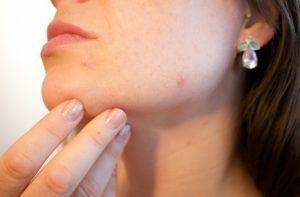 Additionally a predisposition of stress environmental factors are also trigger acne and can present itself as common whiteheads, blackheads and papules and all the way upto more serious pustules, modules and cysts. Topical creams and antibiotics usually work for mild cases. For more sever acne in females, we investigate hormone levels first and treat the causes, i.e. the hormonal imbalance. Professional peels also help. Sever causes of acne may be treated with medicine. Blood counts all other parameters and contraindications are monitored before giving any medicine. How Can I Choose Treatment That Is Best For Me? The treatment you choose depend on the factors such as age, gender, the severity of the acne and how long you’ve had it. At Apex Clinic we customize your acne treatment based on your history, skin analysis and a complete investigation of blood reports. During a peel procedure, the peeling agent when applied on the skin exfoliates the top layer. This signal the cell inside the skin to produce more rapidly which can help hasten skin turnover and prevent pores from clogging up. Moreover there are certain peels which even help to control the sebum production thereby aiding, healing and drying the existing acne. Is There a Treatment For Back Acne? Acne is not limited to the face, it can appear anywhere on the body that has hair follicles including your back, chest, shoulder. 60% of acne sufferers infected with back acne and it is usually a sign that there acne is sever. Medication will heal the acne and the advanced skin brightening peel at Apex Clinic helps to reduce acne scars effectively. If your are prone to acne, we strongly recommend you to avoid traditional facials. At Apex Clinic special range of dermal therapies for acne are customized to soothe, pamper and heal skin without causing any aggravation. Collagen induction is the best way to treat scars. Treatment option can range from microdermabrasion, peels, micro-needling, and even CO2 resurfacing lasers, depending upon the extent and the severity of the scars. Our doctors will examine your skin and based on the extent of damage caused by the acne, suggest the perfect regime for you. What Can I Do In Case of Sudden Breakout? Even while on medication, you may find a stray pimple or two that refuse to leave. For this we use precise inbralesional injection to flatten the acne as much as possible for you to be able to feel comfortable and confident.